Each year the Carolinas Chapter of the PDMA holds a one day innovation conference, focusing on innovation best practices and local innovation success stories. Over the years the conference has been recognized as on par with the best conferences in the innovation space, and we attract top speakers and create interesting networking opportunities since the conference is focused primarily on the Carolinas. Our conference is called Innovate Carolina. For 2013 we have an excellent program planned. Our key theme this year is "Bridging the gap" between ideas and new product introductions. We will have a series of speakers who focus on case studies, lessons learned and other insights that describe how to move from idea generation to bringing new products to market. There's often a "gap" between the brainstorming activity - generating ideas, and product development and commercialization. We want to focus on the gap, to help you bring more of your good ideas to life as new products and services. Our keynote speakers include Chris Trimble, who is an innovator, an academic (professor at Tuck Business School) and an author. Scott Edgett will also address our conference. Scott is an author of several books and the CEO of Stage-Gate, and will share his experience with the group. For "local" flavor we are pleased to welcome Dr. Eric Tomlinson, the Chief Innovation Officer at Wake Forest Baptist and President of the Piedmont Triad Research Park. Along with Dr. Tomlinson, we'll have speakers from a range of local firms, including National Gypsum, Milliken, InVue Technologies, the Center for Design Innovation, and many more. We want to see you at Innovate Carolina 2013. The speakers are excellent, the venue is terrific, thanks to our partnership with NC A&T, and the networking possibilities are unparalleled. There's every reason to attend, and we hope to see you there. While the event is sponsored by the PDMA, you don't have to be a PDMA member to attend. And, while the event is focused on innovation in the Carolinas, we are happy to invite anyone, from any region to attend. In 2012 we had attendees from ten states, including New York, Georgia, Indiana as well as North Carolina, South Carolina and Virginia, and from several countries, including the UK and Singapore. For more information, and to register for the event, please see the conference website. I've begun to wonder if the concept of innovation in large corporation is an exercise in pointless navel gazing. And no, this isn't another bashing of brainstorming, or a recent conversion based on my experiences with faulty innovation logic. No, the challenge to innovation is based on the recent development of a core strength: focus, efficiency, time management. As businesses become more streamlined, more efficient, more time bound, there's ever less time for contemplation, exploration, and, God help us, simply thinking about concepts, needs and alternatives. They are too busy to innovate. I write this after visiting the office of a client recently. I needed from her one fact, that only she seemed to possess. But regardless of when I visited her office, early in the morning, mid-day or late in the afternoon, she was in a meeting. In fact she ordered lunch to one meeting so she wouldn't waste time eating lunch. I finally interrupted one of her meetings to simply ask for the data, which she gave me after apologizing for not being available. When I left for the day she was still in meetings. While she may seem extreme, she is not an isolated case. We've been taught to manage our time, focus on what is important, stay occupied and stay in demand. People who are constantly busy are hard to remove, while people who don't seem as engaged in day to day activities or whose capabilities or energies aren't focused on tomorrow's successes are often considered to be less useful or not contributing. Once we are all fully booked every working hour in meetings, discussions and debates we'll finally be fully efficient, and almost as assuredly innovation will wither and die. To many of these busy executives, innovation activities appear pointless in the short term. Gathering customer needs, thinking about how the future will unfold, contemplating new competitive threats and emerging needs, generating ideas, these actions don't drive revenue tomorrow, and take up the time of people who could be gainfully employed doing other things. I've written before that most organizations value firefighting over planning and avoiding problems. Everyone will excuse a manager who must rush off to address a problem that in most instances probably could have been identified and avoided with some simple forethought. Few firms award status to people who actively predict issues and work to avoid them in advance. Everything about how we think about our organizations, their structures, their processes, their attitudes, their reward systems, focuses on the very near term, or worse, on a backward looking set of metrics. There is far too little time and effort given to considering what comes next. Einstein was a great physicist but also a great philosopher and innovation thinker. Perhaps my favorite quote of his was about problem solving. When asked how he would spend his time if he was given an hour to solve a thorny problem, he said he'd spend 55 minutes defining the problem and alternatives and 5 minutes solving it. Which is exactly opposite of what the vast majority of executives today would do. Most of them would simply define a solution, implement it and have 15 minutes to spare for checking email. In many organizations we undervalue exploration, thinking, empathy for customer and needs, contemplation, stillness. We often need a "beginner's mind" but that requires leaving behind the expert's perspective. Good innovation almost always starts with noticing a problem or opportunity, contemplating a range of solutions, experimenting and interacting with those that have the challenge or problem, iterating a solution and then commercializing. Most of us want to skip from noticing to commercializing, to speed a solution to market, without the contemplation, the thinking, the understanding necessary to develop a really interesting, compelling solution. Our organizations and the corresponding corporate cultures have taught us to be busy, focused on deliverables, always engaged. But this busyness leaves little time for the true drivers of innovation thinking. We are simply too busy to innovate, and what's worse, we seem to enjoy the busyness over the contemplation necessary for innovation. Like a man who starves to death in a bountiful land because he is too busy to plant, many businesses will wither because they were too busy to innovate. With this speed and busyness comes a foreshortening of time. Since we are so busy, we focus on the next activity, the next day, the next fire, postponing issues that are longer term, or require deeper concentration or contemplation. The faster and more efficient a business becomes, the less it is able to think about innovation, and the more attuned it becomes to split second decision making, eventually making all decisions with no thinking whatsoever. This model works as long as the markets and competitors agree to participate in the same race to the bottom. As soon as one competitor stakes out a different business model that offers compelling services to customers, the jig is up. Dell and HP found that out. And their cultures and operating models simply cannot adjust fast enough because all they know is speed and efficiency. Thinking and contemplation, understanding customers, doing things in a different way are simply not in their DNA. Notice too that there is a happy medium. Apple isn't exactly a slouch at good practices and efficiency, but has managed to marry good, efficient business practices with good thinking, contemplation and empathy for the customer. We'll see if they can sustain both, as the pressures for ever more profit and ever more efficiency will weigh down on the profit models. Recently, Yahoo has called in its remote workers, arguing that they need to be in the office to spawn more creativity and interaction. I'm doubtful that's going to work, unless Yahoo sets aside time for people to think and contemplate. Having more faces at meetings simply increases the number of people who think they need to speak, and will increase the number of meetings, which creates the need for more followup and more meetings until... well, you get the picture. We need to break the cycle of efficiency, not to return to sloth and inefficiency, but to return to good management. An executive who is constantly fighting fires and in meetings can't build the skills of his or her team or give adequate praise or feedback. An engineer who is constantly engaged in designs or discussions can't think creatively about new products or desired features. Everything gets watered down, reduced, compacted to the least common denominator when customers want the opposite - something interesting, new, different and relevant. Modern business culture reads like a Jonathan Swift satire - managers too busy to eat, too busy to think, too busy to lead or manage. Like a Modest Proposal, one day maybe manager and executives will exist only to meet and work in a never ending cycle of efficiency - no families, no hobbies, no homes, but constantly efficient and never innovative. Who are my best innovators? As we work with a lot of companies, in the US and overseas, we are constantly confronted with one of the most important questions: who are the best innovators in my firm? Any organization wants to optimize its resources, and increasingly good people with deep skills and commitments are hard to find. Placing the right people in the right jobs, and giving them the skills and freedom they need to succeed is paramount. What every firm wants to do is find their best innovators, place them in conditions that are conducive for innovation, and support them in every way possible. But first, how do they find their best innovators? It's not like strong innovators walk around with a large "I" on their chests, ready to suit up for any innovation emergency. And, to make matters more complex, many good innovators aren't "mainstream" corporate types. Many innovators in your organization may occupy positions that aren't exciting, or may be people who are interested in change and uncertainty, while the rest of the organization is fixated on efficiency. In other words, some of your best innovators may be shunted to secondary positions because their insights and feedback seem like complaining about the status quo. The "Experts" - too often organizations assign innovation activities to the people who know the issue or problem exceptionally well. But these individuals often rule out ideas and narrow the scope too quickly based on past experience. The "curse of knowledge" blinds many experts to opportunities, or the fact that knowledge of the past or expertise today doesn't guarantee success tomorrow. Prominent leaders. Many good leaders achieved their roles through excellent financial prowess and are good at asking tough questions about profitability and cost. Frequently these individuals struggle in innovation activities because the ROI is so uncertain, and they reduce the scope and possibilities to conform to their own financial models or expectations. "Idea People". In any organization there are people who have ideas or who are very creative, but they may not be your best innovators. Like Michael Keaton's character in Night Shift they may record ideas ("feed the tuna fish mayonnaise") but those ideas may not be valuable or practical or solve customer needs. Not locked into the "way we do things"
As you can see from this list, people who exhibit these characteristics are less likely to be prominent leaders and more likely to be solo practitioners or leading small projects because the way they think and act conflicts with a highly efficient "business as usual" operating model. There are a range of innovation assessments you can use to identify good innovators in your organization. The first we use is The Innovator's DNA, an excellent book that calls out five characteristics of successful innovation leaders: associating, questioning, experimenting, observing and networking. Next we use assessments like Foursight, which suggests that individuals have specific skills that are applicable at different phases in an innovation activity, from clarifying to ideating to developing and implementing. This helps place the right people in the right task at the right time. Next we assess the individual and their tolerance for risk, change and ambiguity. Good innovators are comfortable with extending scope, doing new things, cannibalizing existing products, entering new markets. They are comfortable with ambiguity - not everything has to be perfectly understood or "black and white". They are often entrepreneurial, interested in new products or opportunities as opposed to supporting and sustaining the existing processes or products. While it seems unlikely, identifying and consolidating individuals who share these characteristics often creates a very innovative team, while assembling the best and brightest, the "idea people" and those with deep technological skill - the obvious choices - can lead to frustrated teams and incremental innovation at best. More than likely you have good innovators, but because they think and act so differently from the rest of the organization which is so focused on efficiency and effectiveness they've been shunted aside or left in high authority but low responsibility positions. However, with the right leadership they can make a dynamic innovation team, since they share common perspectives, a desire for growth and change and are open to risk. Your innovation teams may look less like your corporate "all stars" and more like "the Dirty Dozen", but its results you need, not beauty or perfection. Building a good innovation team isn't a beauty contest. Good innovation teams will often be populated by people who didn't necessarily fit well into the existing corporate structures, people who aren't focused on efficiency and effectiveness, people open to change and risk and uncertainty. They may not be your top performers or your "experts" - in fact there are many reasons to leave the experts off the team. Using the Innovator's DNA, Foursight assessment and other criteria to determine who your best innovators are, and give them the tools, processes and skills to be successful. Athletes understand the concept of muscle memory. That is, the experience your body has performing specific activities that are consistently practiced until they become second nature. Baseball players take hundreds of swings of the bat every day. Basketball players shoot hundreds of shots. Some are successful, others aren't, but over time the repetition builds muscle memory, which leads to more consistent performance and the ability to execute complex activities without even thinking about it. What we see as effortless performance by athletes in many sports is a combination of good genes and consistent practice. Some athletes are able, for a short amount of time, to get by on good genes alone, but that inevitably catches up to them. As the mantra at cross-country goes: hard work beats talent when talent doesn't work very hard. Why does something that seems so evident on its face in one activity, athletics, seem so unusual in other aspects of our lives, such as business? We expect, no demand consistent performance and near perfection from our professional stars in many sports, and we pay to see these men and women perform. Yet in other aspects of our lives, just as important and just as demanding, we give short shrift to building muscle memory and deep skills. Since this is a blog about innovation, you've probably guessed where I am heading. Since it is baseball season we'll use a baseball analogy: where is spring training for innovators? Where is the constant practice of innovation tools and methods? How does one progress to build skills, or do we simply believe that innovation is an innate skill that doesn't need development? If you believe that, take a look around at the many failed innovation experiments in any business. Innovation, even more than other business skills and functions, needs to be practiced and the capabilities need to be developed. We have muscle memory about efficiency and effectiveness. The existing business processes have been ingrained into our very being - to the point where anything that contradicts existing business process or practice is shunned. Innovation, on the other hand, is rarely engaged, and often in a highly visible, high stress environment, with people who have had little experience and no "spring training" to build skills and capabilities. Is it any wonder that many innovation teams seem uncertain and uncomfortable? This is like asking a novice to walk a tight rope over a flaming pit, with no practice and only an occasional hired guide to shout instructions from afar. When a second baseman turns a nice double play, we applaud and think of a job well done. What we don't see in the baseball ballet is that the shortstop and second baseman have practiced turning thousands of double plays, from many angles and from many different ground balls. Their poetry in motion is the result of a lot of failed attempts, repeated under less pressure at spring training and constant practice. When an innovation team is confronted with big goals and a lot of executive pressure to succeed, they are thrust immediately into Yankee Stadium with no spring training, no muscle memory and very little practice, so why are we surprised when the activities look like something from Double A? While it may be difficult to constantly practice innovation skills, it will become vital to become far more fluid with those skills, since the pressure to innovate isn't going to be reduced any time soon. Rather, what we need to do is invest in building skills and then using those skills consistently so that innovation becomes more like a second nature activity, with good muscle memory, rather than a forced activity that the participants would rather avoid or forget. This means defining an innovation process or capability in your business, training people in the tools and techniques that support the process and then engaging those teams consistently to build more innovative concepts and bring them to market as new products and services. The only way to gain deep and capable skills for innovation is to practice and develop the expertise and muscle memory to make innovation seem more innate. Sometimes when we are asked why innovation seems so natural an activity to us as consultants, we can easily answer: because we do it so regularly it becomes almost second nature. With training and with practice, innovation can become second nature to you and your colleagues. And increasingly, innovation must become second nature to organizations that hope to be around for a long time. For years I've been a fan of the idea of flow, and have felt that the concepts apply very specifically to success in innovation. If you aren't familiar with flow, the concept arises when individuals are engaged in experiences where they are highly skilled and highly challenged. You may think of this when people refer to themselves as being "in the zone", so highly engaged and so proficient that an individual delivers exceptionally high quality work almost effortlessly. Flow is achieved when the challege matches the skill. If the skills are too high, boredom ensues. If the challenge is higher than skill, anxiety and frustration sets in. In his book Csikszentmihalyi talks about work and the concept of flow. 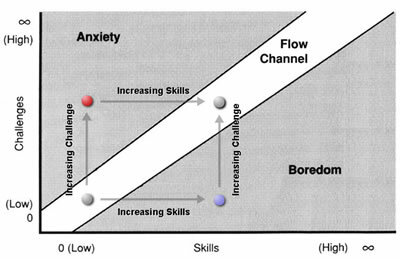 He notes that many people experience flow more consistently in their work than they do in their leisure time, probably because people become bored with leisure - their skills are higher than their engagement or challenges. Innovation, I think, is often quite the reverse. For 30 years businesses have focused on driving inefficiency and variability out of the organization. There's been successive waves of management theory, including the quality movement, business process re-engineering, right sizing, outsourcing and so forth. Our skills are exceptionally high when it comes to efficiency, and exceptionally low when it comes to innovation. Likewise, we've become so accustomed to efficiency, and we understand it so well (and are compensated so well for it) that our engagement to innovation is low, regardless of what we say about innovation. I wrote about this in Relentless Innovation - focusing on the tyranny of business as usual. This means that many organizations start off very low on the skills/challenges axis, and then management places undue pressure on the teams to do innovation quickly and successfully, without providing more skills or knowledge. Following the chart, this places the team very quickly in a position of high anxiety - they really aren't as engaged as they should be, they are unprepared for the challenge and most importantly lack skills. Innovation seems risky, difficult and dangerous, and teams can't achieve consistent success, let alone innovation "flow". How then does a firm or a team achieve innovation "flow"? What does it take for a team or an organization to create the conditions for innovation to "flow", where innovators are always in the "zone"? Clearly two factors are at play. First, team selection and engagement. Finding the right people, those who are open to change and uncertainty, and placing them in a position to do more innovation is paramount. Don't choose the available people, or the "best" people, but people whose perspectives and temperament make them the right people for innovation, who are interested and easily engaged in challenging innovation activities. There are plenty of assessment tools to find the right people, including the Innovator's DNA, the Foursight Model and the Kirton Adaption Index. Second, skill development. For this team of innovators, build their skills and competencies so that they are ever increasing their knowledge of innovation tools and methods. Engage them frequently so their training is activated in actual projects, and perform after action reviews to learn what went right and what should be changed in the next innovation activity. Teams don't learn in a "once and done" model - they need to repeat their successes and learn from their mistakes. Unfortunately there is no agreed body of knowledge that spans all of innovation. You should invest in innovation training, but be careful of "certified" programs that are popping up everywhere. Look for innovation training offered by experienced trainers who also provide innovation consulting services - you need real world examples, not academic perspectives about innovation tools, methods and their applicability and success rates. Why is innovation so difficult? The reason innovation seems so difficult to many organizations is that it is virtually impossible for anyone or any team to get anywhere near the "flow", to get into the innovation "zone". Innovation teams are placed under inordinate pressure to deliver valuable results with little time and no training, often with poor direction and no tools or methodologies. Instead of defining skills and finding the right people, we corral the available people and kick off projects with little forethought or definition. Then executives wonder why innovation seems so difficult or returns results that seem so incremental. Find ways to get your teams and your organization into the innovation zone. Use the concept of Flow to improve WHO you select, HOW you direct them and WHERE and WHEN you offer training and skill development. Then you'll find it much easier for your teams to achieve innovation flow. This is an article about innovation, but also a cry for some common sense from our government. As an innovator and a person who leads innovation activities in the US as well as around the world (Malaysia last week, Turkey next week, China and Ireland in the next few weeks) I see innovation in many different regions and as many different activities. I like to say that innovation starts at the front door. This is true for a company as well as a country. Throughout this article I'll try to relate the concept of innovation in both regards. First, at the company level. How a company greets new people, new ideas, new perspectives has a lot to do with its innovation capability and prowess. The "front door" is where we greet people and welcome them in, or discourage them and turn them away. The front door is where we bring new concepts, new ideas, new realities into our business, or where we ignore them or turn them away. What does your "front door" look like to people with ideas? Is it an open doorway, welcoming new concepts with clear pathways to success, or does it resemble a castle, with a drawbridge and a moat to discourage visitors? The front door in this case stands for our openness and willingness to consider new ideas, and the ability to process the new idea behind the first consideration. Welcoming attitudes are not enough. If they were, you nice aunt with the good cookies would be an excellent innovator. You need to have open doorways, and paths for the ideas to follow, and the people who support those pathways must be as welcoming to new ideas as you are. As I travel from country to country it constantly amazes me how easy it is to enter many countries I visit. Recently I had the opportunity to visit Colombia. There, once I left the plane and entered the immigration hall, there were at least 30 active agents reviewing papers and passports. The process took about 5 minutes and was painless. This experience has been consistent in many countries I've visited. In Malaysia recently the immigration and customs process was excellent. The message these countries send to visitors and immigrants is: welcome. Contrast that experience with our nation's "front door" - our immigration process at our national airports. The system, even for US citizens, is time consuming and feels more like an inspection than a welcome mat. For visitors, our immigration system is confounding. I have a good friend from Europe who avoids visiting the States for business because he feels the process entering the country is so burdensome. What message does our "front door" give to potential business visitors, immigrants and others? It appears we actively discourage visitors and immigrants, which will limit our innovation potential. Don't get me wrong on this - every country needs to establish how immigrants and visitors will be allowed into the country and accounted for. I fully understand and appreciate why we have border controls and immigration systems, but can't they be attuned to the needs of the visitors and the needs of the economy? At a time when we need more educated, more creative people, they are likely to be rebuffed or at least intimidated at our nation's "front door". One of those crazy inspirational posters that often hang in the corridors of soulless cube farms shows an eagle flying high over the mountains. The caption reads "your attitude determines your altitude". While corny, this message is vital for innovation. Negative attitudes at any stage of the activity slow or diminish the chances of success. Negative attitudes or reception at the beginning often stop activities in their tracks. Your front door - how you recognize and welcome new ideas or perspectives - has a lot to do with the rest of your innovation activities and outcomes. That's true whether we are talking about one business, or how we welcome visitors and immigrants coming to this country. When we actively turn people away, or intimidate potential visitors or discourage them from coming, we all lose. Another corny but true saying is that a candle loses nothing by lighting another candle. In the same way innovators lose nothing by interacting with other innovators, but lose everything when the interactions are delayed or denied. Let's put out the welcome mat in our businesses. New ideas, new concepts, new perspectives must be welcomed for innovation to thrive. Likewise, let's find a way to welcome visitors and immigrants so our national fabric thrives and we can continue to lead the world in innovation. Innovation starts at the front door - what sign do you want your visitors to see? "Welcome" or "No Visitors"? Join me please in parsing everything that is wrong with the article title "Why innovation by brainstorming doesn't work". In this article, which seems to suggest that the only activity necessary for innovation is brainstorming, brainstorming comes in for a kicking yet again. What? Don't we have an article every three months telling us that brainstorming doesn't work? Can't we find a new punching bag? I don't hold a particular brief for or against brainstorming. But we should consider it in its context. Brainstorming is a tool for generating ideas. You can choose to like and enjoy brainstorming, or you can choose to generate ideas using hundreds of other creativity and idea generation tools. But that's all SCAMPER or brainwriting or mind mapping or any of hundreds of other potential aids are - just tools. And tools used with insufficient preparation or for the wrong application or by an inexperienced user are often blamed for the outcomes. Brainstorming has a bad reputation, there's no doubt about it. That's because brainstorming is typically a poorly administered meeting with little preparation, the wrong participants with the wrong scope, and often one or more individuals who have a personal agenda. ANY meeting that lacks good preparation, a consistent scope and goal and the right people is doomed for failure. Why pick on brainstorming as if it is the only instance of poor leadership, poor planning and the misuse of tools or techniques? As to the "studies" that demonstrate that individuals can generate more or better ideas by themselves, I'm open to the theory, but I know that teams move ideas through companies, not individuals. It may be the case that we would all generate "better" ideas, if we could establish a quantitative gauge for betterness, if we all generated ideas by ourselves. But that activity would be pointless, because just like it takes a village to raise a child, it takes a group to move a nascent idea from concept to product or service. Further, I've worked with many teams using brainstorming or other idea generation techniques and have been exceptionally happy with the results. Sometimes it's the facilitation skills, sometimes its the preparation, sometimes its the mix of people in the room, sometimes its the personal agendas. Many factors can derail any idea generation, and only the right combinations make them successful. That's why good idea generation is so difficult. It's easy to skip important factors and easy to derail the activity, and hard to do it well without all factors working together. Another concept in the article, and this is probably not the fault of the author but of the editor, is to conflate brainstorming as if it is the only activity in innovation. We at OVO promote, and many others do as well, an innovation process made up of picking and using the right tools, at the right time, in the right context. Brainstorming may be a step in the innovation process, or not, but it is only a single step. Until you've got context (a clear opportunity statement or problem statement), knowledge and foresight (trends, scenarios and customer insight) you don't have an adequate context or scope for innovation, and every idea, regardless of how you choose to generate them, is based on opinion, not needs. So, can we give brainstorming a rest? It's been the favorite punching bag for far too long. Let's assert that many brainstorms aren't successful, but as I've written before, that's not a failure of the tools, but of the users. And if brainstorming doesn't work for you, use any other creativity or idea generation technique that does - there are plenty. Just realize that idea generation is simply one step in an innovation process, and without good context and the ability to manage and evaluate ideas successfully, the best idea generation techniques on the planet are useless. Good innovation relies on a complex system of knowledge, insights, tools and people. Blaming innovation failure on brainstorming is pointing the finger of blame at a tool that is just one small portion of the process, when other equally or perhaps better tools exist. First, check your premises. Have we done a good job preparing the people? Do we have the right people for the job? Do they understand the needs and scope of the activity? As a friend used to say, good craftsmen never blame the tools for their problems.